We love rapini but it’s one of those vegetables that people love or hate. It’s been a nice challenge to tame the bitterness of this cruciferous beast and we’ve made tremendous progress. This recipe is a great side dish for Italian-style meals. *NOTE: If you have a tendency to find rapini or broccoli-rabe too bitter we suggest you try to blanch with water and vinegar prior to tossing it into the sauce. 1. In a medium sized pan, fry the ‘nduja (or cut pancetta) in 2 tbsp of olive oil. 2. Once the ‘nduja (pancetta) browns add the onions and garlic. 3. When the onions soften and the garlic begins to brown add 1 cup of chicken stock. Let it come to a boil. 4. 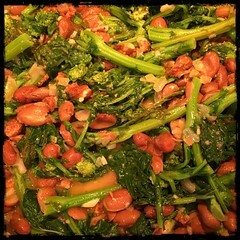 Add the rinsed Romano beans, lower the heat and let them ‘stew’ as you blanch the rapini. 5. In a large pot of boiling water and about 1/2 cup of white vinegar, blanch the rapini. 6. As the liquid in the stewing beans reduce you can add the rapini with some lemon juice. 7. Let cook for a few minutes (covered) to allow the rapini to heat up. 8. Taste and add salt and pepper to taste mix well and serve.